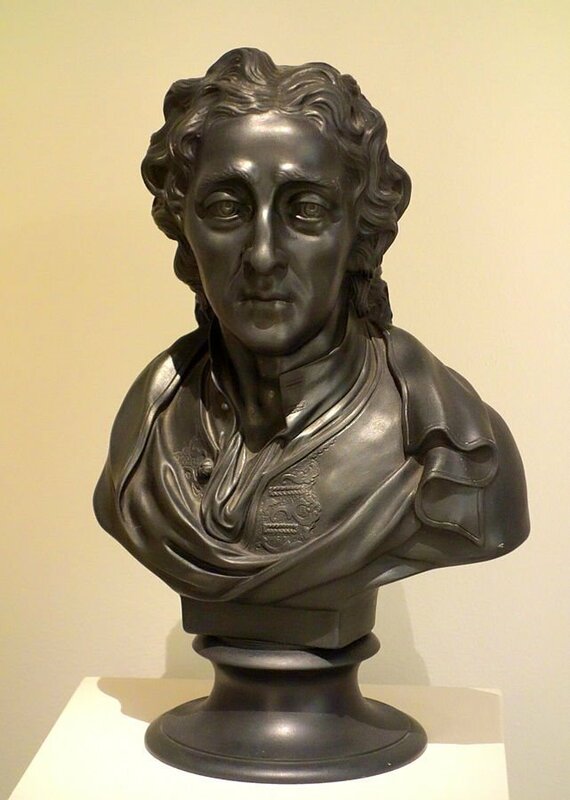 Wedgwood Black Basalt is a hard, dense, fine-grained stoneware, which Josiah used for portrait medallions, seals, vases and urns, busts, tea ware, and other items. The busts and figures were made to emulate old bronze statues. Basalt has been produced continuously since its introduction in 1768. Its rich black color has been enhanced by a variety of decorative techniques including the application of bas-reliefs, engine-turning, gilding, enamel painting, inlaid decoration and others. It was one of Josiah’s favorite ceramic bodies, and he said of it: ‘The Black is sterling, and will last forever.’ History has so far proved him right. Josiah Wedgwood coined the term Black Basalt back in 1766 and today the name has transformed to Black Basalt. The trials on production of the black body had begun in July 1766 and by 1978 Wedgwood was in mass production of the wares for the market. Black Basalt is still one of the best stones manufactured and used to produce high quality wares. The Black Basalt was manufactured from reddish-brown clay that was burnt in red hot fire until black. Compared to the local Egyptian Black wares that were being produced in the early years, Black Basalt were more superior in the general appearance. Josiah Wedgwood lived in between 1730-1795. He was the most influential figure in the western ceramics history. His was innovative, stylish and unique designs of wares. The wares he designed were not only extremely fashionable, they were of high quality. It is said that his artistry was inspired by the American, Europe and England styles. Wedgwood’s talent shined when he entered into partnership with the renowned ceramists of the 18th Century, Thomas Whieldon. Thomas encouraged him and introduced him to the manufacture world. It is this time when there was an industrial revolution, being an innovator at heart and industrialist, Wedgwood formed several companies, one with his cousin Thomas Wedgwood, his personal company at Burslem, and other with friends and businessmen. Wedgwood built Etruria in 1771, where he manufactured ornamental vases. He later transferred other wares to the Etruria factory where he performed most of his operations. It became the very first factory to have purchased and installed a steam engine. Josiah passed in 1795; his family transferred the factory to be based in Barlaston where it is still running until today. Even though Wedgwood ventured into many kinds of wares like Jasper, Black Basalt was one of the best productions he had engineered and has stood the test of time even after his death. Black Basalt was developed in 1768 and has turned out to be very successful commercially. Back in the early years, the Wedgwood factory have very difficult time meeting the soaring high demand for the wares made from Black Basalt. The 18th Century ladies, particularly loved he contrast the Black Basalt created with their white hands. Some of the items that were designed from the Basalt included but not limited to cameos, seals, gems, and intaglios. The black salt strength and versatility resulted in the manufacture of various wares for instance busts, tea wares, vases, ornaments, candlesticks, table wares, medallions and many more. Black Basalt hand-painting was another great innovation, the encaustic enamels were used to copy the Etruscan classical pottery designs. Wedgwood patented this innovation design in 1769. Many designers and manufacturers have since settled to the production of Black Basalt wares. The Black basalt by Wedgwood was more rich in color since manganese were added to the mixture. The black salt was mainly used to manufacture of the exquisite wares like medallions, portrait, vases, library busts, plaques and candlesticks. The antique originals were the main inspiration of the designs. The new decoration methods, for example encaustic painting and bronzing that copied the Italian vases and ancient Greek required a smooth surface. The ideal body was therefore Black Basalt and therefore Wedgwood patented them. A brush was used to paint the encaustic designs on the basalt surfaces. The colors green, pink, blue, white and orange were varied more than the ancient vases simple blacks and reds they were supposed to emulate. Encaustic wares being both useful and ornamental, they became very popular. For Josiah Wedgwood, lots of research, experimentation and tests had gone into the project. The result has been the promising stoneware including Black Basalt. When he said that Black is Sterling and will stay with us forever, he meant is words. The highest quality ornamental pieces and many other wares are still produced using Back basalt. More and more people love the Black Basalt wares, an exquisite ceramic body. Wedgwood Black Basalt wares has a lot of meaning. One does not only carry along the British history but also is a proud owner of extremely high quality stoneware. Decorate your space using the wares with nice unique patters, have old statures, a mixture of some modern touch and matching colors.